Overall only £8 is spent on research per person affected on mental health in the UK, which is 22 times less than per person for cancer (£178) and 14 times less than dementia spend (£110) and despite 75% of mental illness starting before the age of 18, less than 30% of the total mental health research spend is focused on children and young people. As a result, the majority of mental healthcare resources are not designed or developed for young people, leading to poor treatment outcomes in young people and hindering prevention efforts. Mental illness should not be seen as an inevitable part of life. The current state of mental health treatment would simply never be accepted for a physical condition. 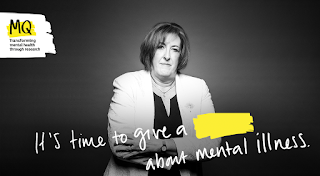 MQ’s ‘We Swear’ campaign aims to make it clear that radical change is needed right now and asks the public to show they ‘give a s**t’ by swearing to take on mental illness. Through research we can get to grips with this growing crisis in young people's mental health - and build progress towards much-needed hope for everyone affected. Swear to take on mental health. Search #WeSwear on social media or visit MQ mentalhealth for further information as to how you can help.